This week's library book is Key Writers on Art: The Twentieth Century. The book consists of encyclopedia-type articles in alphabetical order, starting with Theodor Adorno and ending with Wilhelm Worringer. Each article describes and explains briefly the person's ideas, thinking and major contributions to the field and is about one to two thousand words long. Each article is written by an expert on the person's life and work and ends with a brief biography and bibliography. There are no illustrations. I read it all the way through. The "key writers" are art historians, art critics, cultural theorists, and (the largest proportion) philosophers. The list includes Clement Greenberg, Meyer Schapiro, Roger Fry and Clive Bell, Martin Heidegger, Jacques Derrida, John Dewey, Sigmund Freud, Julia Kristeva, Griselda Pollock, and so on -- all names that ring some bell or press some button; and many more, famous or less well-known, for a total of forty-nine. The book turned out to be about as far as I want to go with the philosophy of art (and aesthetics, of course, which falls in the field of philosophy). It was a good overview of the field however and I'm glad I read it. 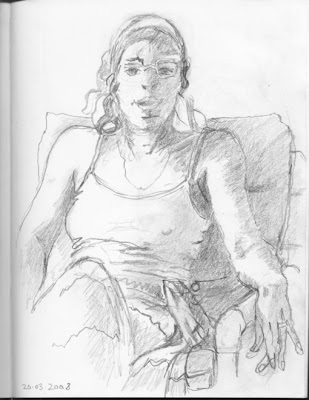 To me, the anthologies of writings by actual practicing artists covering different periods are more valuable to the painter or the art student -- the Renaissance to the 19th century edited by E.G. Holt; the first half of the 20th century edited by Herschel B. Chipp; and Post WW2 to the mid 1990s, edited by Kristine Stiles and Peter Selz ("Theories and Documents of Contemporary Art"). 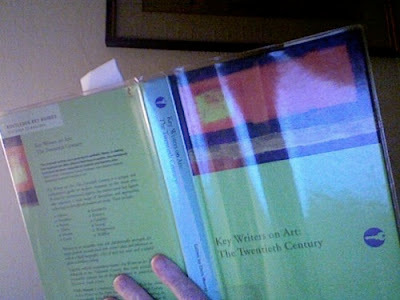 Key Writers on Art: The Twentieth Century, edited by Chris Murray, published by Routledge, 2003; 314 pages with index.